With technological advances, it has become the prevailing tendency to look for answers to health problems in hospitals. While there is nothing wrong with that, one only has to cast one's eyes back two or three decades to see that medical care wasn't so widely available to all. This indicates that during that time and earlier, cure was not the buzzword, but by necessity prevention was. 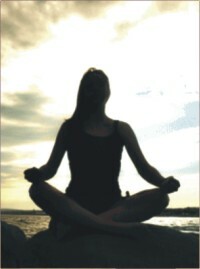 One of the ways in which people could maintain their health was through the practice of yoga. Yoga has been practiced for over two thousand years. The word 'yoga' comes from Sanskrit and is derived from the root 'yuj' meaning 'to control', 'to yoke', or 'to unite'. Rafi Hossain, who has been teaching yoga from 2004, believes that the discipline is relevant and crucial in this day and age. “The benefits of practising yoga are tremendous. For example, people use make-up to beautify their exterior appearance, but beauty comes from within. If one is not feeling well, no amount of beautification can make one beautiful. What yoga does is it brings out the inner beauty in a person. If you practise yoga regularly, your body will be fit, you will be calm and will be glowing from your inner beauty,” said Hossain. Food habits are also important, “We all have our own unique body types. There are some foods that you can eat without a problem, but if I take them, I might have an allergic reaction or my stomach may not agree with it. Our bodies react in different ways. Therefore, it is very important that we recognize the diet that will suit our body and stick to it. We have experts who can determine a person's body type,” he explained. “If someone practises yoga regularly, and takes the right food according to his or her body type, I can guarantee that 90% of diseases will be cured without the aid of doctors or medication. It can cure as well as prevent. It is the lifestyle that is important. We have to understand that we are natural beings and natural beings have certain laws, and for healthy living those laws must be obeyed,” he added. When asked whether the practice of yoga has gathered any momentum in Bangladesh, Hossain said, “It is still new, and there are many who try to learn it themselves by reading books and watching videos. That is a big mistake. Yoga has to be learned under the supervision of a Guru. There are many things such as breathing techniques, which has to be taught individually. If done right it can be of immense benefit, but if done wrong, it can do equal harm. It is easy to take health for granted while it is good, but once that starts to go, it takes everything with it. With our focus on instant gratification, we have a tendency to look for quick-fix solutions, like rushing to the doctors after having ruined our health. We need to realise that it is how we have maintained our bodies over a long period of time that will determine our future health. Yoga, as a practice that has endured for two thousand years, is a good instrument for this maintenance. I wished, I so wished that I were there in front of the US Capitol when history was being made. I am not an American, yet the electricity that swept the country on 20 January had not left me untouched. An eloquent speech delivered by Barack Hussein Obama carried messages of hope for the Americans as well as the people across the world. I am lucky to have lived this historical moment when the first African-American president of the United States was sworn in. "I had been planning to be at Obama's inauguration for the last one month, and my visit to the National Mall on January 20 was completely worth the effort. There were huge applauses for Obama, his family, Hillary Clinton, and Jimmy Carter. Bush and Cheney were booed rather loudly- an experience that couldn't have been felt on the television screens. I screamed and danced like everybody else," said Tejaswini Madabhushi, an international student at George Mason University. I myself was at our university's ballroom to watch the inauguration ceremony on a projection screen. Everyone in the audience stood up and clapped when Obama walked toward the podium. I was amazed at the respect that the people showed for a person who they were only watching on screen. It was a well-deserved ovation, I believed. The hall burst into roaring applause from hundreds of pairs of hands after the pledge was taken. There weren't only Americans in the crowd, but students and faculty members from Asian and African countries, all gathered to watch history as it unfolded. Radia Abdul Wahab, a graduate student of Biomedical Engineering at George Washington University said that her university observed the Inauguration Day as a holiday. Radia, who lives in Alexandria, Virginia, said that the parking lot of the metro station close to her home was full by 4:00 am in the morning. There were people everywhere. "My husband decided to work from home, considering the heavy traffic on the road," she added. As I watched the inauguration of the 44th President of the United States, my mind journeyed back to the 2008 US Elections night. I was at home that night, following the news updates on Google and waiting for the historical announcement to be made. The Internet speed wasn't doing me justice, so I left for campus after 10:00 pm. I didn't want to miss the live coverage of Obama's victory speech at Grant Park, Chicago. I don't know if I grew too emotional but tears did fill my eyes when the MSNBC camera from time to time relayed images of Jesse Jackson, the legendary American civil rights activist. I don't know what emotions the tears of Jackson carried. I wonder how it must have felt for the black people across America when they heard Obama deliver his victory speech. It must have been one of those too-good-to-be-true moments. The new American President has proved that a candidate's skin colour can be a secondary factor in a race as important as the US presidency. When asked what his feelings are about the new transition that took place in the political scenario of the US, Shalom Staub, Assistant Provost for Academic Affairs at Dickinson College said, "I, like everyone around me, was gripped by the power of this moment in history. We all knew that we were watching something that undoubtedly will forever be remembered as "history", and by a sense of the potential for something good to emerge for the US and the world. And, I'd have to say that the moment and the man represent the very best of American principles and ideals." Obama has become not only the President of the United States of America but the most powerful leader of the world. He preached that change was what the Americans could believe in. With the worldwide recession, countries all across the globe are hoping that Obama would save the superpower from its current state and eventually, the world. People are expecting a lot from the new world hero, and his message of changing lives of the people in the poor nations only heightens that hope. But time will only tell us if he would be able to bring about the changes that he said he would. At least, I know that I want to live to see those dreams of changes becoming reality.